Corporate bond funds have produced above-average rates of return in the past ten years. There was particular interest in companies from the BB rating segment, i.e. issuers at the threshold of high-yield to investment grade bonds. These would often be bonds that for some reason, e.g. an inferior financial report, had been downgraded but were in with a chance of a re-upgrade. The offered yields are therefore higher than those for highly rated issuers. There are relatively few funds that restrict their investments to such companies. One of them, ESPA BOND CORPORATE BB (ISIN: AT0000A09HC7) by Erste Asset Management, received the award as best fund in its peer group over the past ten years at the Lipper Fund Awards 2019. The fund had recorded an average annual growth rate of 8.14%. *) This award is even more important since the fund won it not only in Austria, but also in Germany and in Europe. *) Source: FMP, Erste Asset Management as of 31 December 2018. The performance accounts for the management fee and any performance fee. It does not allow for a one-time load of up to 3.50%, if applicable at the time of purchase, nor any other fees reducing return such as individual account or depositary fees. Historical performance data are not indicative of the future development of the fund. We took this award as opportunity to talk with Fund Manager Bernd Stampfl about the fund, interest rates, and his investment focus. What sort of developments have been driving this segment lately? What are the yields like? Last year, the political risks were coming to the forefront again, which led investors to re-assess their positions. Issues like the trade war, the rather risky budget policy of the Italian government, and Brexit were the general drivers of uncertainty. In spite of the correction towards the end of 2018, the BB corporate bond market has retained its stable development. The favourable yield level at the beginning of the year and the outlook on an imminent agreement in the trade conflict has caused investors to search out risk again and to re-take positions in this asset class. We have benefited from this situation and are now back at pre-correction levels. Why should one invest in this segment at the moment? Towards the end of last year, the spreads of BB bonds had widened to a level that, relative to the default risk at hand, have now turned these assets into an interesting investment opportunity. And the ECB has recently indicated that no end is foreseeable for the zero interest-rate policy in 2019. This means that the search for yield is ongoing. Another factor that, from our point of view, supports the case for these bonds: in contrast to US companies, European issuers use the proceeds of their bond issues for investments and not so much for share price nursing. As a result, operating profits continued to increase last year in Europe. Also, the companies have improved their balance sheets in the past two years and have further strengthened their operations. How would you describe the corporate bond segment in general? Who are the typical issuers? Do they come from the financial or the telecoms sector? Or from a different one altogether? Breaking down corporate bonds by sector and debt outstanding, the typical issuer usually comes from the industrial sector, telecommunication, retail, or the automotive sector. The respective shares of these sectors have remained very stable in recent years. Significant shifts are only facilitated by changes in ratings. For example, after 2017 and 2018 more companies were “have been” upgraded to the investment grade than downgraded to high-yield for the first time ever. The biggest BB issuers in this peer group are Telecom Italia and the Spanish Telefónica. The Israeli pharmaceutical company Teva, the French supermarket chain Casino, and the car manufacturer Fiat are also prominent members of the BB segment. Total volume has remained very stable in view of the robust market environment and the aforementioned aspects. In summary, BB offer a surplus yield relative to the low interest rates and the interest rate differential on safe (i.e. investment grade) corporate bonds thanks to the increased spreads. In this environment of low interest rates, defaults are unlikely to become a problem. The annual Lipper Fund Awards from Refinitiv are an event that has already built a certain degree of tradition in the fund industry. Funds are awarded that have achieved above-average, risk-adjusted returns on a continuous basis (categories: 3Y, 5Y, and 10Y) in comparison with other funds. 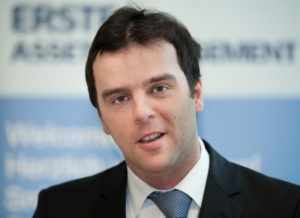 The funds have to be accredited for public distribution in Austria, and the initial approval has to date back at least three years. The cut-off date for this year was 31 December 2018. 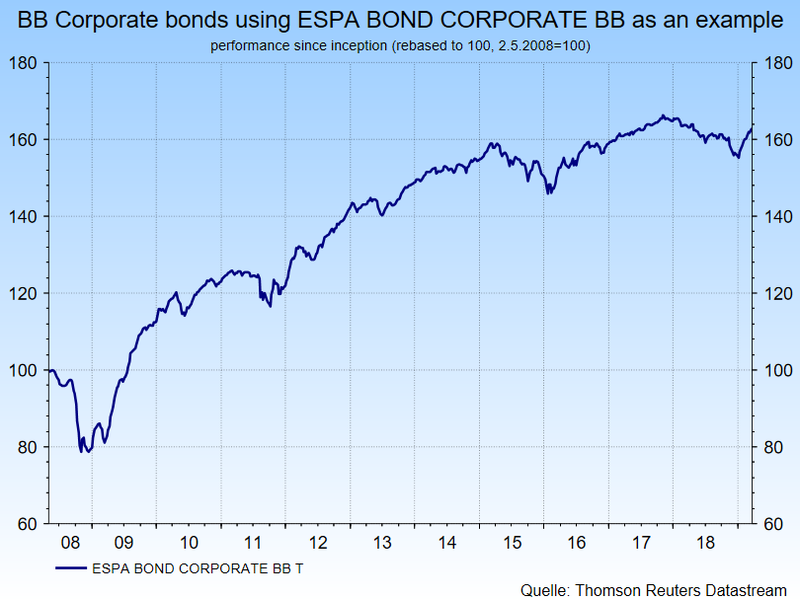 ESPA BOND CORPORATE BB is a broadly diversified fund that invests in about 170 largely EUR-denominated corporate bonds from countries such as France, the UK, and Italy as well as, to a lesser degree, the USA and emerging economies like Brazil and Mexico. The focus is on telecommunication and the basic materials sector. The foreign exchange risk is fully hedged against the euro.